Emergency situations can happen out of the blue, and it is essential that you are well prepared to face them. 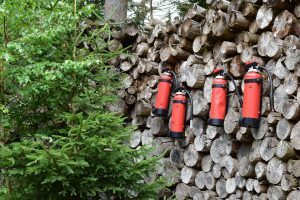 In this article, we will address the importance of knowing how to operate a portable fire extinguisher. Call the fire department and ask for help; even if you can fight the fire, you might need the professional expertise of firefighters. Search for a safe way out of the building and away from the fire; in case your efforts to put the fire out remain without result, you will need to get out quickly. To remember the right way to operate a fire extinguisher, use this acronym that firefighters teach civilians: P.A.S.S. – pull, aim, squeeze, sweep. Pull – the first step is to remove the pin. You will notice that this operation will break the anti-tampering seal. Aim – when you’re aiming the nozzle of the extinguisher at the fire, make sure that the direction is toward the base and not higher; this will help you to deal with the source, and not just fight the flames that will reignite as soon as you empty the extinguisher. In case you’re using a CO2 extinguisher, make sure that your hands are not in contact with the horn; this can become very cold, and your skin may suffer damage. Squeeze – this part is straightforward; you squeeze the handle, and you will notice the substance being released. Sweep – while keeping the nozzle directed at the base of the fire, begin using a sweeping motion; this way, you will cover a larger area, and you will eliminate the sources of fire faster. In case you notice that the fire starts again, repeat all the steps described above. Should the fire extinguisher become empty, and the fire is still not out completely, move away from the fire and wait for the firefighters to appear. All fire extinguishers have a specific range between 8 and 12 feet, so make sure that you’re standing at a distance that gets you close enough to the fire to make the fire extinguisher useful, but not too close that sparkles from the fire can jump on your clothes and set them on fire. As the fire begins to slow down, you will be able to approach and eliminate the source. A portable fire extinguisher is effective against small, contained fires. That means that you should never attempt to put out a fire that has already engulfed large spaces and which is too powerful to fight on your own. Make sure to evacuate everyone from the building, and treat those with minor wounds with the help of an emergency kit. If the fire breaks out and begins filling the room with smoke, don’t attempt to put it out, as inhaling the smoke can make you lose your consciousness, trapping you in a dangerous situation. Class A extinguishers – these are filled with water or foam, and they work against fires caused by cloth, rubber, plastic, paper, or wood that caught fire. 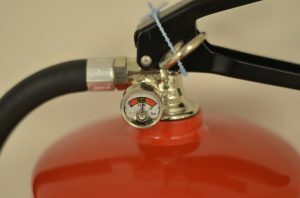 Class B extinguishers – using carbon dioxide or a type of dry chemical, these serve for putting out fires caused by grease, oil, or gasoline breakouts. Class C extinguishers – electrical flames should not be doused in water; these extinguishers use the same agent as class B models. Class D extinguishers – with the help of a dry chemical supplied in powder form, these will put out fires involving combustible metals. Class K extinguishers – using either a wet or a dry compound, these are excellent for putting out kitchen fires caused by grease and fat. Class ABC extinguishers – this is a universal type that addresses situations that cover the first three classes presented above.